This is the easiest cheese pie you will ever make, 5 minutes to prep and another 20 minutes to bake. Pies are a big part of our weekly menu, kids just love them and they can be a complete meal. Their favorite is the classic spinach pie which is made with phyllo, spinach, feta and some egg. I either use ready made phyllo dough which only contains flour and starch (no fats) or I may make my own thick phyllo (crust) made with olive oil using this easy recipe. When we have cheese pie (tiropita), I’ll usually combine it with a salad and that’s a complete meal. I had a package of pita bread in the refrigerator that I had forgotten about, and needed to use up so I came about this recipe. Initially I was going to make an old recipe of mine using pita bread and making a kind of open faced pita, but today I needed something more substantial as the kids had no lunch. So why not put more filling in between 2 pita rounds and bake it? 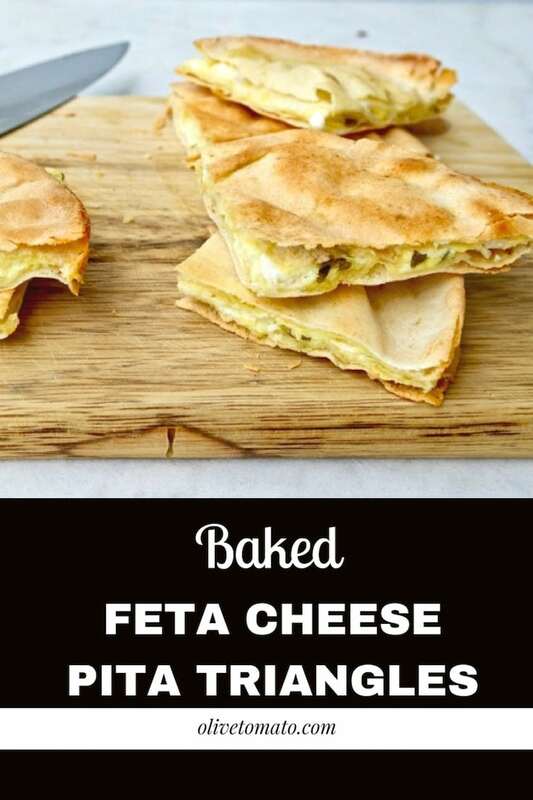 Before I go ahead describing this recipe, I want to clarify how we use the word ‘pita’ here in Greece. Pita usually means a savory pie like spanako-PITA (spinach pie) or tiro-PITA (cheese pie) but we also use it to describe this type of flat bread, also known as pita bread. So don’t get confused when I use the word interchangeably. 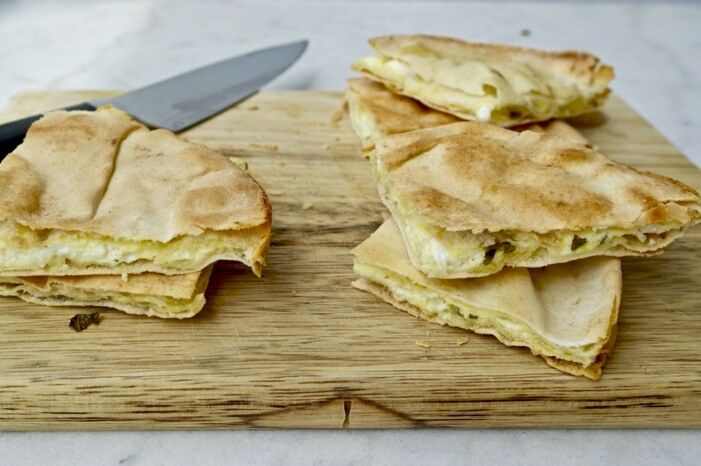 So with this recipe, you basically top the pita bread with cheese-egg filling and cover with the other pita round. Apart from the ease and the fact that the kids loved it, using pita bread as a crust is also healthier than other crusts. Pita bread is so versatile; it is perfect for a pizza crust, but I had not thought of using it to make a Greek style pie. The good kind only contains flour and salt, none of those palm oils or vegetable oils you see in other crusts, plus you can use whole grain versions. And you don’t need to limit yourself to a cheese filling, you can put spinach, peppers, zucchini and basically make any filling you want. Also please note that pita bread can puff up when heated so when baking I cover (not wrap) the tiropita with aluminum foil and I flip to the other side mid-baking. 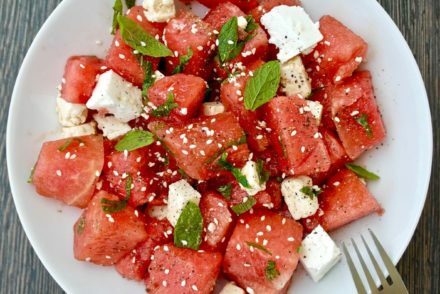 For a snack this can be served cut in wedges or for a complete meal you can serve it with a seasonal salad. 1 teaspoon olive oil plus more for brushing. Preheat oven at 350 degrees Fahrenheit (175 C). In a large bowl mash the feta, eggs, a bit of fresh ground pepper and the mint and 1 teaspoon olive oil. Brush a large pan with olive oil and place for pita rounds. 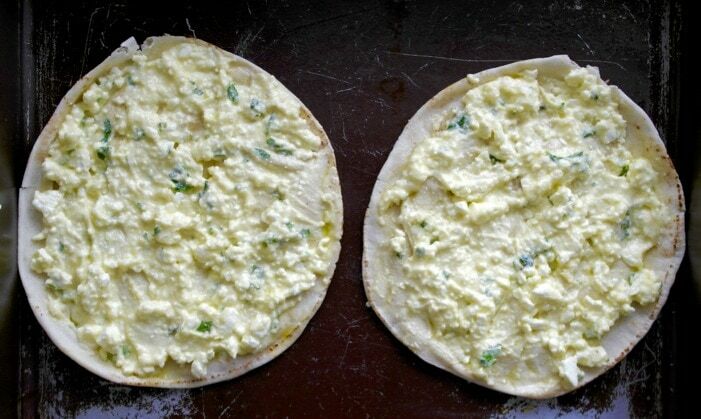 Brush the pita with olive oil and spread with feta mixture on each pita bread. Cover with the other 4 pita breads. Sprinkle the pita bread with water drops, brush with a bit of olive oil and pierce the top pita breads. Bake for 10 minutes and then turn over and bake for another 10-12 minutes. 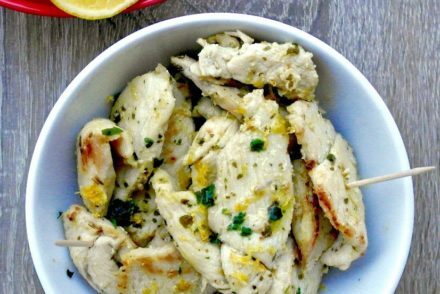 Remove from oven and cut in wedges with a pizza cutter. Wow!!! This looks amazing!!! Did you make it with the thin pita that most people are familiar with, or the thick Greek style pita like is used for a gyro? Thanks Nancy! This is made with the thin pita, not the souvlaki pita. This sounds great with spinach and red pepper too – thanks for sharing! Oh my goodness! I just ran from the kitchen after eating this, as I cannot wait to review it! This was absolutely terrific, and so easy – will definitely become a recipe in a frequent rotation! I served it with a Greek Salad and it made a terrific lunch. It would also make a super appetizer. I used fresh dill instead of mint. I had just made Avgelemeno so had the dill on hand. I got a big bundle full at the market for one buck. The dill was fabulous! I accidentally wrapped instead of covered the pitas while baking, so the crust was very soft. I wanted a crisp crust, so I took the foil off, and let it crisp in the oven. Loved it slightly crispy! I just received my 2017 September Cooks Illustrated magazine, reviewing the best feta, but I couldn’t find any of the “recommended” – Real Greek Feta, Dodoni Feta, Boars Head Feta, Nikos Feta. The Recommended with reservations is Eurphrates, Valbreso, Mt Vikos. and the NOT recommended is the Organic Valley Feta). 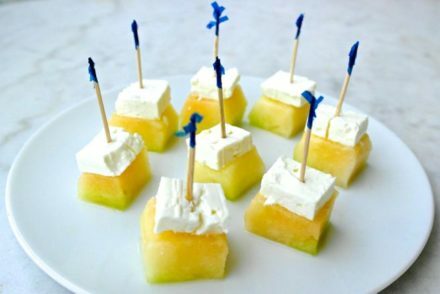 I’m sure this recipe would be good with any feta, however! Its just me and my husband, so I used a 7 oz block of feta, and actually only used half the mixture (saving the other half for another lunch). That way, I made 1/4 recipe – and we split one pita, for a modest lunch. I sure could have eaten more, though!!!!! I am assuming you are in the United States, so I will let you in on where I get my real Feta Cheese, now that I am no longer in a major urban area (with a Greek store close by). Trader Joe’s has REAL Greek Feta in a tub (sheep), made for them in Greece, 10.5 ounces. Mt. Vikos is good if you are short of time because most supermarkets have it, but I find it small and expensive. Costco has real Greek Feta from Greece in a tub, and it is also Organic. It is called Kolios and is a sheep and goat. It is also 10.5 ounces like Trader Joe’s and is about the same price…they are both around $6.00. Costco also has a more tangy Feta Cheese from Bulgaria wrapped in a large vac packed block called VIGO, and the size is what I like the most about it. It is from sheep, and the block is maybe double the size of Kolios and Trader Joe’s. 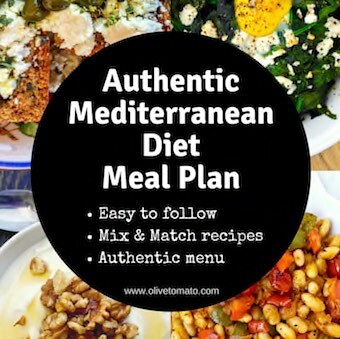 It is around $9.00, and since I cook mostly Greek food lately, I need a large amount on hand for recipes like Spinach pie, or on the side with the oil based vegetable dishes. The only down size is that it is not in brine, but you can easily make your own with water and salt. I store it in a large round Tupperware. Anyway, I hope this helps! (And you might also want to do a google search to see if there is a Greek ethnic market near you–there are more of them throughout the U.S. than you might think! They will have a nice selection of different Feta cheeses from Greece). Thank you Angela for these recommendations! Good Info! Thanks! We have a Costco membership – I will check it out! Trader Joes is a half hour away, but might be worth the trip for this, and other items! THANKS!